I have often wondered in present years about the vagaries of fate and synchronicity. Years before, I would have thought this timing nothing more than an odd coincidence. But now, I find myself sifting through causality and motive in the persons directly involved. I am not saying I believe that the Montana State Police and one “James Walker”, resident alien, a real resident alien, were directly motivated by Mulder to act in any particular way. Of course not. Yet, it is unavoidably strange that, on the day when Walter Skinner was due to arrive home after an absence of over six years in time for the huge Anniversary celebration at the Capitol, Mulder managed to get called out into the field after five straight months of staying at home. Certainly, one could argue that the call was due. This five month run was the longest period I can recall during his tenure as Chief of UNP where Mulder did not have to make a field visit. Yesterday's call was legitimate; there’s no question of that, given who was involved. And yet, I cannot stop wondering about the oddities of timing. My mind latched onto this puzzle, and for some reason, won’t let it go. Where once I looked and saw only the shape and contour of the physical form, I now look and see behind that form a multitude of possibilities. If Mulder were here, he’d smile at me and tell me, “Go with it, Scully. Let that right brain of yours get some much-needed exercise.” But then again, given the subject matter and my fledgling thoughts, it’s very possible he’d avoid my look and mumble something in Mulder-speak, implying I’m making much ado about nothing. Of course, if he did that, I’d be doubly suspicious, quite a deliciously interesting conundrum. Over the years, as Mulder became more circumspect and controlled, I believe I inherited many of his more outrageous attributes, even if I don’t utilize them in the same way Mulder did. I have no desire to suffer as he did because of things I know to be true, or because of my curiosity or mischievous bent—I use stealth. Mulder, bless him, tried, but invariably got caught. And yelled at, quite frequently. Usually by Skinner, not an enjoyable situation. I should know, I was the recipient of quite a few of those dressing-downs, myself. But there is something interesting about Mulder’s previous relationship with Skinner. 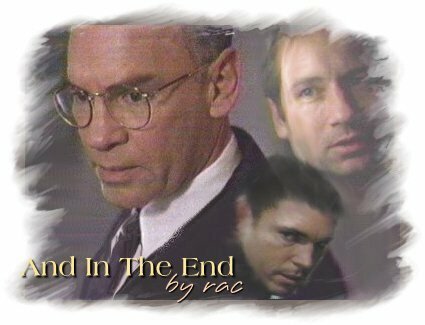 It is not that Mulder's behavior was so very different toward Skinner compared to the other supervisors he had; Mulder’s tendency to ignore the rules was legendary, after all. It is simply that, unlike the others, Mulder’s relationship with Skinner was so very complex. And, I’m beginning to suspect, as I begin to put together all the little bits and pieces I’ve gleaned over the years—things that, in and of themselves wouldn’t necessarily point in any one direction—that the complexity in their relationship went much deeper than I ever knew. I plan on following up on this very new, very surprising theory in the days ahead. As far as Mulder is concerned, I will have to fill my mind with other thoughts when he’s around. He’s far too good, even when he doesn’t mean to be, for me to be lax about it. Perhaps if I fill my mind with thoughts of Philip, it will cause Mulder to consciously turn his mind elsewhere while around me. For all his abilities and worldly sophistication, he’s still adorable when he’s embarrassed. I do love pushing his buttons. It’s interesting. As much as he was reprimanded while working for the FBI, as many times he was written up, was he ever fired? Was his career permanently compromised? No. To be honest, I can’t imagine what Skinner did during those years to keep Mulder ‘silicon-coated’. No matter the fires Mulder jumped into or started, no matter the things that burned on, with a little judicious scrubbing, he was nearly good as new. All in all, it was amazing, considering the seriousness of many of those fires. But enough of the past. I’ll have to make sure to keep this section from Mulder’s prying eyes. I honestly don’t know what his reaction would be to my vague speculations. Skinner arrived with all the military pomp they could muster at the Four Corners Complex not more than one hour after Mulder’s plane took off for Montana yesterday. Skinner’s family had been flown in, and they were there to great him, along with various VIP’s and a majority of the news reporters working the Capitol. It’s Major General Skinner now, and he will be honored as a hero later today. I understand his actions saved the lives of eight men, at great risk to himself, while they were dealing with al’Fukkar. It doesn’t surprise me; no matter his grouching and growling over the years as our supervisor, when in the field, there wasn’t a better agent. His concern for the men and women under him was always primary, and I know very well how far he would go to assure the well-being of his subordinates' lives. Skinner walked a fine line in the old days, and I wasn’t always certain to which side he was leaning. And yet, when the entire story came out, I was shamed by my certainty much earlier in the game that he had chosen to align himself with the shadow men, and was therefore our enemy as much as they were. We all had our parts to play, I suppose, and in the scheme of things, it was very difficult to see clearly all the other players’ motivations and situations. In any event, I was much more inclined to believe supposed hard facts and evidence in those days. It has taken me much longer to learn to see beyond what appears to be, and into the reality that lies behind the surface. Despite the horrors we’ve experienced, I give thanks to God that, instead of simply losing many things, I can truthfully say that I’ve reaped much these past years, also. Different things, but nonetheless valuable. Now I can repeat Mulder’s line about growing maudlin and morose; it is a hazard of looking back, for all of us who lived through those perilous times. Let me try to recount less personal information, and focus on perspectives about this era that I believe people should know in years to come. Today is a huge international holiday, the third anniversary of the end of the alien “war” and their expulsion from our planet. It’s referred to as a war; however, it was like no war we had ever fought. How does one fight a war with an enemy one cannot see, and in ways one cannot anticipate? Even though the presence of aliens among us became public knowledge, the governments never admitted to their citizens how precarious our position was in the scheme of things. Public policy was always much more confident and optimistic than reality, and in this, I could not fault them for their stance. What could the average citizen do, truthfully, against such an enemy? There was enough terror and helplessness in the world; there did not need to be more. For years after Mulder and I and our team first uncovered the bulk of the evidence against the Consortium and the aliens, we were forced to make many of the Consortium’s goals our own. Their labs, their notes and their research became ours. Their race to find an antidote, a serum against the alien-producing virus, was now ours. At first, it was a race to find and secure all the Consortium labs before the aliens destroyed them; without the research laid down by those who had worked for decades on the scientific theories, our hopes became dim. Some labs and the information they contained were destroyed before we could find them; there was no way to know what had been destroyed, or what information was now lost to us. But many labs were found intact, fully functional, and, with the exception of all new human trials being forbidden, things progressed forward. I say new human trials. This is a difficult thing to remember; it was a difficult choice to make. I can honestly say I was glad it was not mine. When we found the research facilities, some private, some military, we also found a large variety of test subjects. Humans. People taken from all walks of life, from all places, as I had been, to fulfill the role of guinea pig in the Consortium’s dual goal of creating a perfect human-alien hybrid and at the same time, to create behind the aliens’ backs a working inoculation against the alien virus. The condition in which we found these people was beyond belief. There were some who were in the midst of experiments that, no matter how horrible they were, could not be halted due to the nature of the work: the underway trials involving alien virus gestation and direct intervention with the experimental antidote. Those so used were dead already, either way; the alien virus was growing within them. I couldn’t do it. I could not personally participate in the continued work on these unfortunate, cursed individuals. Which, in the long run, made no difference; there were plenty to whom the plight of these people was easy enough to ignore, given the alternative, and so I simply avoided those research facilities in my travels. And if I had trouble dealing with it, I cannot begin to comprehend the impact it had on Mulder. Mulder was adamant that one of us monitor each experimental phase at all the operating labs, to assure adherence to the government’s edict that no more experimentation continue beyond these ongoing trials. All of these active labs ended up on his work list. Truth and knowledge came with a price: not always being able to rest in the relative ease of our previous high moral ground or our lofty ideals. I recall once during that time when Spender looked at me with that calculating and penetrating stare he employed to intimidate those around him. He was still alive and had been given immunity for the copious amounts of information he could impart (although, to be honest, he was under armed guard at all times and quite restricted in his movements—they didn’t trust him, not an unexpected reaction). That was the last I’d saw of him for quite some time. I made sure to arrange my schedule to that end. Now, looking back from the perch which he had indicated, I am so thankful to be able to say my choice wasn’t as clear-cut in one direction or the other as he had predicted. Those shades of gray he mentioned previously, but did not incorporate into his own choices for my future thoughts, played a large part. We won. We won because we successfully invented the universal serum which would inoculate all humans against infection with the alien virus. We were successful with that invention because our predecessors had not only laid the ground work, but done a good deal of the necessary work in the trials and testing. Their efforts, and our subsequent success, however, were paid for by the suffering of an untold amount of human beings; men and women who had left behind a gaping hole in the lives of parents, siblings, spouses, lovers, children, friends and co-workers, an entire armada of lives and events left raw and incomplete by their absence. Our lives were literally paid for by the blood of others. Does that make us, those who made the decisions and who carried out the choices that were necessary at the time, as guilty as the men whose research we inherited? I have thought long and hard about this in the past three years. I have had my dark times, the times I wallowed in guilt, a kind of Valley of the Shadow of Death. I walked in that valley for some time after the Expulsion; I could afford to do so at that point. We had fought the Good Fight, and we had won. Now there was time to indulge in such moral dilemmas, wondering if indeed it was a good fight that we had fought. Once again, it was both my faith and my logical mind which helped me to see my way from the dark place I had wandered. The answer became clear to me, and with it, I let go of all the unnecessary sense of wrong-doing I had allowed myself to feel. We had done right. We had done the right thing. We did not undertake our decisions and actions lightly, as a small group, bent only upon our own survival. As a people, we would either survive or perish together. We would survive because of our mutual efforts, efforts put forth from governments and scientists from around the world cooperating without stint. If all of humanity together could not marshal the necessary combination of intelligence, inspiration and intuition necessary to produce the one thing that would save us, then maybe we were just one more evolutionary stop along the way in the greater plan. Darwin’s theory, which we espouse so earnestly, also holds true for us. We had never before encountered anything which had so severely and thoroughly threatened the supremacy we enjoyed in our environment. When we did encounter the aliens and the threat they posed to our species, it invoked within us with a strong will to survive, along with the same kind of moral outrage that Galileo faced hundreds of years before when he dared to suggest that our planet was not the center of the universe. How dare these creatures topple us off the throne of our kingdom? That reaction, of course, is mere hubris. Ego. But the will to live is an instinctive, automatic reaction. That response comes from far more than our egos, and I believe it to be a good response. I have come to the conclusion, based upon the cooperation and concerted efforts I observed during the years that we, as a species, fought our own annihilation, that some sixty-five years prior, it was a combination of hubris, deadly fear, greed and sheer evil that created ‘the plan’ as we came to know it. I have wondered in these past years just what kind of work might have been accomplished had ‘the plan’ been more inclusive and geared toward allowing any and all of humanity to help save itself. We are an amazing species; if there is one thing that I have learned, it is that there are unexplored depths of possibilities within our own genetics. Given enough time, even we can learn to work miracles. Is it not possible that all those years ago we might have combined our talents in the cleansing and strengthening light of our various faiths (instead of in the dark and with evil intent as those few men in control chose to do) and found within us the will-to-life that God infused into our very beings? Might we not have ridden that will-to-life along a less horrific pathway to a quicker, happier ending? Naturally, my opinion is only that; others might disagree and employ all sorts of facts or ideas to back up their belief. I have only the strength of my faith, and the strength of my own experiences of things not seen but known. I cannot help but believe as I do, having lived the life I have lived. At the very least, we as a species now enjoy, for the most part, a great rebirth of the values which were the underpinnings for all the major systems of religion, and a new, unprecedented tolerance, and even understanding, of the various religions and cultures toward each other. Those who face death know that it changes something fundamental inside; when a world faces death, it causes profound changes on a grand scale, also. Such heavy thoughts on a glorious day. I will soon need to get ready; as Mulder’s Deputy Chief, I’ll have to stand in for him at the festivities today. We need this celebration: a celebration of life and renewal, not just of one country’s survival, but of all of humanity. A true Earth Day. How fitting and, once again, interestingly and provocatively coincidental that it should occur on the summer solstice, the longest day of the year. Historically, it has forever been a time of celebration and joy in the fullness and bounty of life. I cannot think of a more appropriate setting for a new celebration of life as we give thanks for past mercies and look forward to new joys. I’m looking forward to getting to see Walter again in person and hope to spend some time with him during the festivities later in the evening. I want to introduce Walter to Philip. Both are strong, honorable men, and both are important to me in their individual ways. I want to ask Walter to do the old-fashioned thing of walking me down the aisle. I wish Mulder were here. Hopefully, soon, if he can straighten out the situation in Billings. Meanwhile, I think I’ll sit back and watch the fireworks. Not the ones they’ll shoot in the sky tonight, although I love those, too. It is the more human kind I refer to; the ones I’ll no doubt see when Walter sees Alex Krycek at the celebration.